Late-nite comics are entrenched in warfare against the Trump administration. All of their material revolves around attacking Donald Trump, his staffers, and his family members. But one comic went way over the top in his assault on Vice President Mike Pence. Perhaps the height of Colbert’s fame came when he roasted George W. Bush in character at the White House Correspondents’ Dinner. Colbert has moved on from mocking conservatives to outright attacking them on his late-nite “comedy” show. Colbert and others of his ilk are far less interested in being funny these days, and much more enthusiastic about parroting leftist talking points. A particularly loathsome moment came when Colbert praised Karl Marx and Friedrich Engels —the architects of an ideology that led to the death over 100 million people over the last 100 years — during a monologue that attacked Donald Trump Jr.
Colbert’s colleague Jimmy Kimmel even got his talking points on healthcare directly from Chuck Schumer. As one can imagine, the show lampoons Trump and all his associates mercilessly. Apparently, that’s what passes for comedy on the left these days. Comedy works best when it’s moored in some kind of truth. Impugning Pence’s moral character and religiosity for a woefully unfunny bit is indicative of the comedic stylings of today’s late-nite comics. First, the left blasted Pence for his policy of not having dinner alone with a woman who isn’t his wife. Considering both the revelations and excesses of the #MeToo movement, Pence’s rule seems to be quite sound. The left is too busy attacking Pence for his social conservatism while predators have roamed free in liberal Hollywood for decades. Next, the left tried to label Pence a homophobe because of his Christian faith. Gay Olympic figure skater Adam Rippon spent his entire 2018 Olympics experience ragging on Pence. Finally, comedy host John Oliver attacked Pence and his daughter Charlotte by mocking her children’s book about the family’s pet rabbit. Comedy show hosts of yesteryear used to be nonpartisan, which was uniting for the country. But now the shows have completely devolved into leftist hackery. Late-nite host Jimmy Fallon was criticized by the left for not attacking Donald Trump enough on his show. Then the left-wing mob came after him for being too friendly with Trump when he appeared on his show; Fallon even mussed Trump’s famous hair. Fallon kowtowed to the mob and apologized for actually being a decent human being toward his guest and not dedicating his entire show to partisan attacks. Fallon has since towed the line with his late-nite comrades. 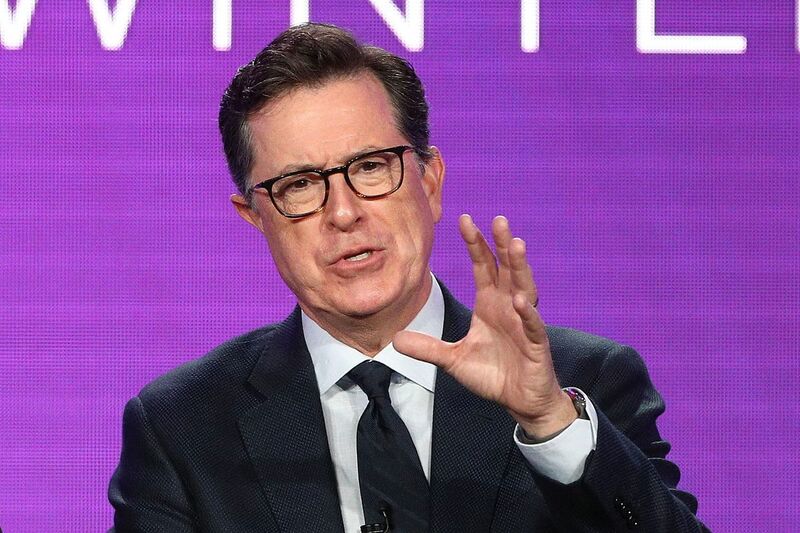 Colbert’s baseless attack on Pence is indicative of the shallow comedy being mined by late-nite hosts, but it appears audiences could be growing tired of the boring schtick. Audience ratings for “Our Cartoon President” are at an abysmal 42% on Rotten Tomatoes.